I’m too excited to finally get to share this beautiful couple! Jill and I talked on the phone a few months ago before I went on maternity leave to plan out her engagement session with her fiancé, Luke. We met up at The Cabin at Old Spur in Timmonsville, South Carolina. Jill and Luke were complete naturals in front of the camera, you could feel so much love oozing between the two of them, which makes my job that much easier! I had such a good time laughing with them and capturing their sweet relationship. They never skipped a beat with one another, laughing, spinning in circles and cutting up. They even incorporated Luke’s love of fishing by “catching” Jill in the net and bringing along fishing poles to fish out the pond! Bringing along things that the couple enjoys doing together is always fun to include in the engagement session! It doesn’t have to be anything crazy either, just something special! Prior to our session, Jill told me that her and Luke’s wedding would be taking place at The Cabin at Old Spur; and that we would be allowed to shoot their engagement session on the property! After we spoke I googled the venue, and saw a few photos of the property. Y’all, the photos did it no justice! This wedding venue is so beautiful; open air barn, outdoor bar with adjoining bathrooms, a huge bridal cabin with a gorgeous bridal suite, a quaint pond that the ceremony location over looks and more. We traipsed around the property and found plenty of great spots to shoot. In the coming weeks, Jill and I will be back at the property for her bridal portrait session, and I guarantee those images will be gorgeous! Keep an eye out for that blog after the wedding! 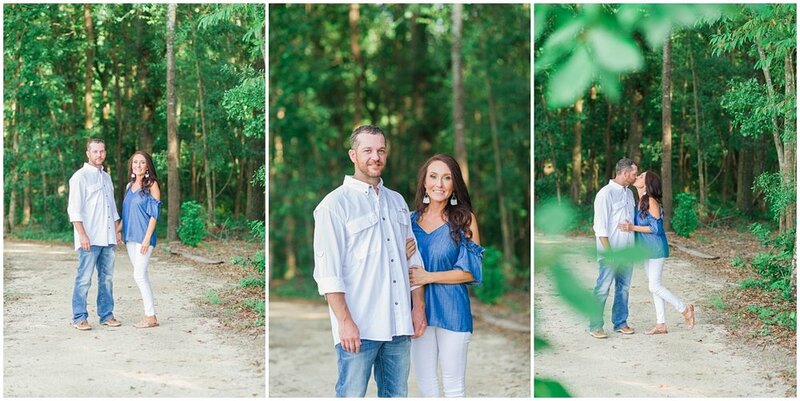 I can’t wait until their big day to see how everything comes together, I just know it’s going to be amazingly beautiful; just like Jill and Luke! Check out Jill and Luke’s engagement session below and leave them sweet words of encouragement as they take on marriage in a couple of months!